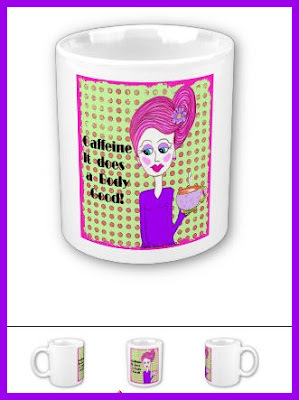 Check out a new product Linda found and a new friend Linda made at CHA. Another project is in the works, a super duper red scarf in yummy cranberry. Do you have any crafty angels – angels you’ve made or angels you’ve met? Cyndi's shibori background quilt is finished...yay!! Stitch a simple Be Mine Valentine design for your beloved. Craftside went to CHA and it brought back tons of fun pictures of all sorts of creative people. Check out some of the fun pictures and projects along with a link to more studio space photos and how to bead quill around a core bead from the book Bead Quill Jewelry. 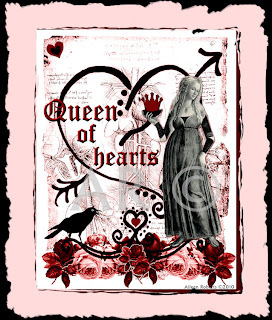 If you are looking for ideas for fast and fun home-made St. Valentine's Day cards, check out what Sherri has to offer. Single Canvas Head Panels Available also. Single Canvas Flower Panels Available also. Canvas Art Doll-I used a head and a flower canvas panel to create the head and ruffle. The body is made from watercolor paper. 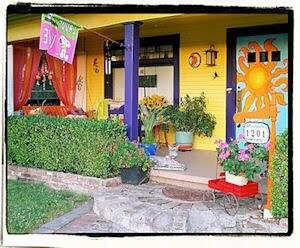 All were colored with Color Mists. Here's a new digi piece I just finished in time for Valentine's Day! 4 Cards with matching envies. 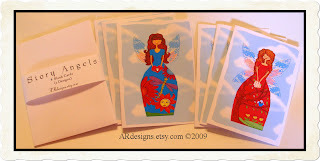 A set of 4 Story Angel cards. Both card packs have been hand drawn by me and then professionally printed and mounted on cardstock with matching envies. (if I can't contact you then I will have to move on to the next winner). 2 names will be drawn on February 15th, 2010. WHAT IS ONE WORLD ONE HEART? 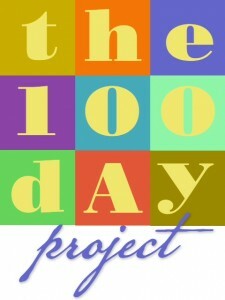 Lisa from Whimsical Bohemian created this event in 2007. The original idea behind this giveaway event was to bring bloggers together from around the world who may never ordinarily meet. It closes the gap of the blog community and enables us to interact, discover new and wonderful people, and in the process possibly win a prize or many prizes along the way. 2007 had roughly 85-90 participants and many connections were made because of it......friendships that are still going strong. We had a strong showing the first year for sure, and then in 2008 we had just about tripled that number. In 2009 there were 911 participants, to say I was amazed is an understatement. 28 countries were represented in the 2009 event as well. This is more than wanting to win something.......that is only the means.......in the end it's about finding kindred spirits. Someone who may be fairly new to blogging, not sure how to navigate, find others and have others find them....Some are long time bloggers and in some cases well known in the blogging community. Whatever the case it brings all of them together. This is an INTERNATIONAL event that has and had participants from the US, Canada, France, Sweden, Germany, Finland, Malaysia, Brazil, The Netherlands, Australia, New Zealand, Scotland, Ireland, England,Wales, Slovenia and more. It transcends geographical location, socio economics, political affiliation, religious beliefs......it's a coming together like the giant community we are on this planet. If only it took a simple giveaway to create PEACE everywhere, in the mean time here we give from our hearts. We are not solving the worlds problems nor are we curing anything nor are we changing the world. We are merely generating a closer community between humans through blogging. What more could I ask for, my little idea has surpassed my wildest dreams of what it could become. Crafty Blogger Blurbs & Shout-Outs! 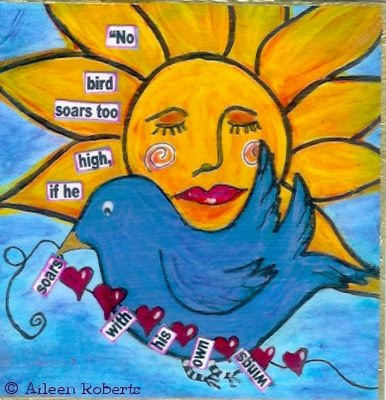 I was first lead to Dofishes from a comment that she left on my blog, so I fired up the ole cruiser and hopped in for a little jaunt along the information superhighway and found my way to her wonderful blog full of eye candy and inspiration. 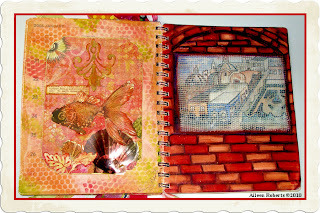 From there I took a turn that lead me to I Hanna in particularly to her 2010 Postcard swap, but do check out the rest of her blog it's chockful of inspiration and info. After a short stretch of my legs I ventured on and came across the witty blog of DottyAngel-you must read about her year long challenge to buy only handcrafted or secondhand for her house and closet you won't be disappointed, I promise! I had time for one more turn along the Internet highway, so I stopped by MayaMade and I was happily transported to another quaint art blog of wit and whimsy! Do also check out her Barn transformation while your there! Now back to your regularly scheduled Blogger Blurbs and enjoy! How to use waterslide decals for decoupage under glass. Put your original designs anywhere with inkjet or laserjet decals. Check out Kathryn Lane Berkowitz's gorgeous seed bead work! Hey diddle diddle, the pig had a fiddle...This verse was printed on the fabric that Linda used as the inspiration for one of her favorite quilts. Have you ever stitched on silk gauze? Vote in the poll and tell us about your experience or lack thereof by leaving a comment. Get the 411 on a group of crafters who can help you help Haiti. At Craftside there is the full low down on all the signings, classes, and make & takes with the authors for the big winter 2010 CHA show, some wonderful journal page art, how to make an Egyptian stick, a great tool for making stripes, turning a paper clip into a jazzy bookmark and some recycled zipper jewelry. Check out this cute appliqued apron that Cathie whipped up for Better Homes and Gardens. Sherri has gathered together a collection of projects that would make great St. Valentine's Day gifts. Nothing quite says 'I Love You' like a personalized gift, hand-made by you. I still haven't come up to full speed yet, after having pneumonia, so I thought I'd re post the link to my FREEBIE section on my website. 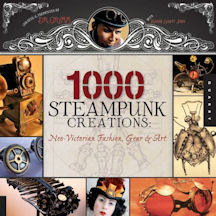 There you will find 3 pages of tutorials, how-to's and freebie images to download. TAKE ME TO THE FREEBIES! Boy was I proud of myself for being ahead of the game with my swaps that I had signed up for. I not only got my swaps done on time, which I normally do, but I was a month or more ahead of schedule because I didn't want to feel overwhelmed with the holidays.....or perhaps it was a premonition that I was going to get sick. I was even jokingly called an over-achiever for getting my stuff done early! Well guess what I have egg on my face! Yep, I forgot a swap that I had signed up for it! I didn't write it down and then being sick it was totally out of my head until I received an email from the host. Not only did I forget, I am shamefully late! My once untarnished reputation has taken a hit and I am duly embarrassed! Thankfully Su the host has been quite understanding and is awaiting my above ATCs! My lesson learned....write it down!! A friend shared this site with me and I just had to pass it on. 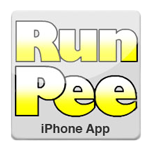 Do you ever go to the movies and just have to pee but hate to miss anything well now you can be prepared ahead of time and check out runpee.com to find out the best times to go. Or you can download a phone app to check while your there. Here's a revison to a previous page. Click HERE to view my other pages. We've had some good rain the last few days. Here's a new pic of my latest erosion bundle (Day 14). You can see the book is starting to swell a bit. I was tempted to throw dirt at it but resisted. 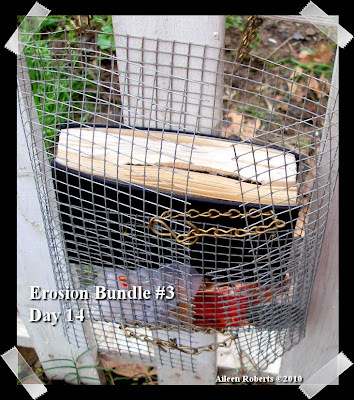 Click HERE to view past erosion bundle pictures. In my Altered Diva group we're doing a recipe swap. 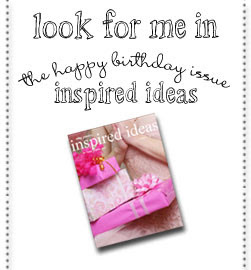 Our hostess with the mostess Joanne will put our recipe pages we send to her and we'll receive back a cool recipe book! 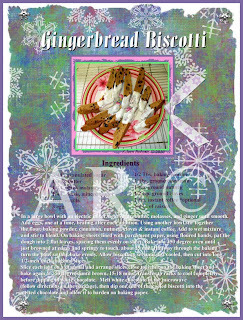 Above is the front of my recipe page. Having not felt overly creative I've been working on partial projects finishing them up. 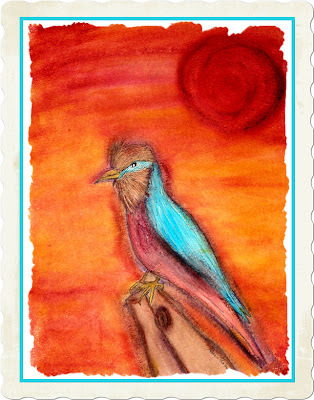 Above is a Watercolor done on 8x10 cold press watercolor paper using my Color Mists and pen and ink. After I added some shading with water soluble pastels. Giant Cupcake or is that a Circus Tent for Midgets! Since I'm still recuperating or I should say getting over pneumonia hubby stepped in to decorate son #2's giant birthday cupcake. Son #3 baked the cupcake and then hubby decorated it...we affectionately call it the Circus Tent Cupcake LOL. I had been all set to do a giant pacman cupcake using fondant but that will have to wait until I'm feeling better. 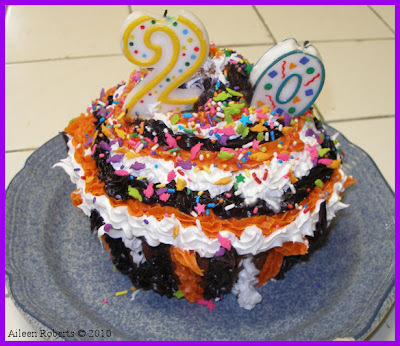 You can click HERE to see my other giant cupcake I made for hubby's birthday. Have a sick kid at home? Check out this collection of crafts Sherri has compiled to help entertain them while they get better. Alexa gets back into her crafty groove with a cool & modern statement ring! The first week of 2010 at Craftside brings you ho-tos on crocheting broomstick lace and then framing it up to store your earrings, stringing up a ribbon and pearl zigzag necklace, and a call for entries for a new book-1000 Ideas for Decorating Cakes, Cupcakes & Cookies. Even though this crafty princess is from the South, she still needs a warm crochet hat now and then. Connie has a "handy" motif you can adapt for multiple uses. Stitch her suggested saying or choose one of your own. Madge opens up a rather sticky can of worms in this post about copyright infringement. Right click, save. Done. A new year, a new technique! Cyndi shares the first steps to making a shibori background fabric for a new quilt. Eileen went shopping in her closet and made a 20-something sweater new again. Here’s how to update a dated BIG sweater. character. 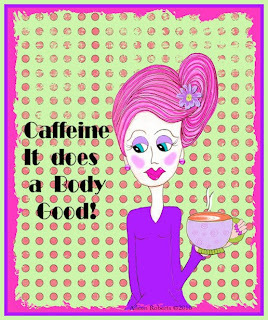 Met Marcie She loooves her coffee! Been a bit quiet around here I know. I've been hit with a whopping case of pneumonia its like that movie same time same place since it was a year ago that I had it almost to the date! Yep, I did get a pneumonia shot, regular flu shot and the H1N1 shot. I was under the delusion that because I got the shot that it was for sure I wouldn't get it again but that's not the case I'm told....now ya tell me! Hopefully I'm on the mend now and each day will be better! 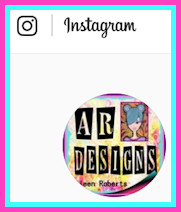 My blog friend Kathryn over at KV Creative Designs is having a Blog Giveaway in honor of her Blog Anniversary stop by and check it out HERE. Step into the wayback machine (10 points if you can name the show that's from) and visit a past post (HERE) where I show my technique on using Gouache (pronounced Gwash) paints to colorize black and white images. If you look closely you can see these lovely ladies in the background that I had originally painted using the gouache paints. Now jump back in the wayback machine to present time and here you are with the above piece. 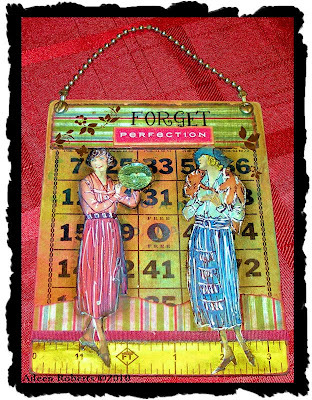 I originally had added my colorized ladies to an altered vintage bingo board, but then was at a loss, thus it sat around ever since not knowing what else to add to finish the piece. Then BINGO the right wording I wanted to use came to me and I added that along with a glass half marble (hard to tell in the picture, but its magnifying the bird nest she's holding) and a chain to finish it off. This goes back to what I've said in the past...never give up hope on a project nor be discouraged because the right thing will eventually come along. Yes, I admit it can be frustrating, but that's why I work on more then one project at a time. I've learned to trust and have patience and not try and push it. Time to make room for 2010 magazines and cold storage 2009 issues. Make this cute magazine holder with a little paper and Mod Podge. The last week of 2009 Craftside has a tutorial on how to build a raised bed from recycled pallets, turn a greeting card into a mini sewn journal, some fun shadow photos, a green leopard Christmas tree to file away for next year and the winners of The 19 Days of Holiday Goodness Giveaways. The Crafty Princess is planning to craft some black-eyed peas for the new year! Check out this simple and yummy recipe. Start a new ornament collection - join Connie and stitch a new one each month. The designs are abstract, so they are suitable for any holiday. Madge shares some new advice for a new year! 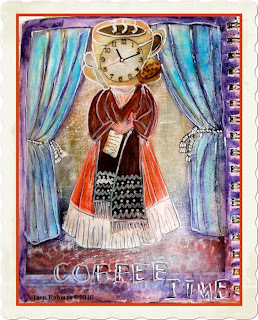 Nikki Yeager shares her glue transfer technique with Cyndi's readers! Thanks Nikki! Come one, come all - free decorator candles! The only catch is that you have to make them yourself; but that’s half the fun. Here’s how to make your own zero cost candles. Print out and customize 2010 calendar pages. Choose from several designs. 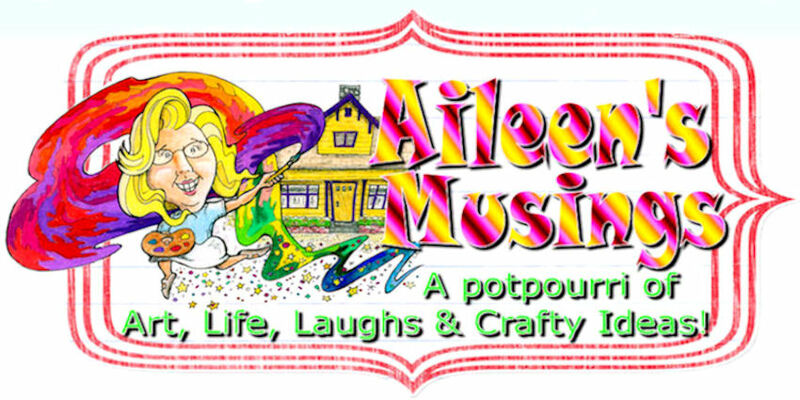 Visit Aileen's profile on Pinterest. Create a little Pollock Art! Would you like to be notified when this blog is updated?